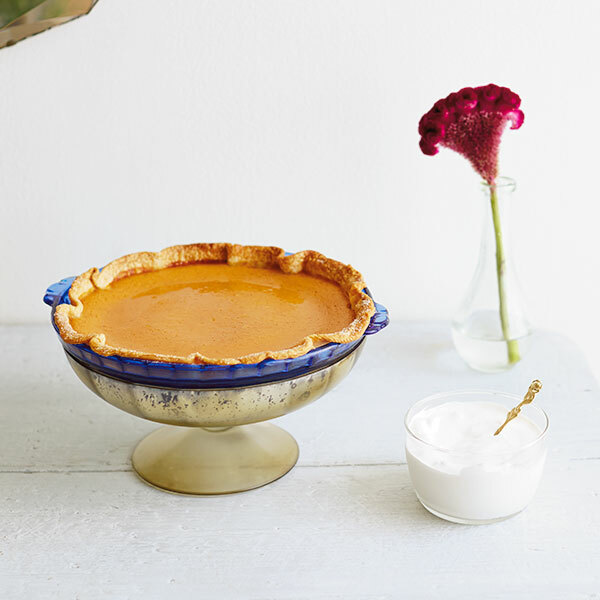 You'll find lots of recipes for making pumpkin pie, the Miss Congeniality of all pies. But Hallmark has a tried-and-true Pumpkin Pie recipe sure to please even the pickiest of your pumpkin eaters. This traditional Pumpkin Pie recipe is topped with gingery whipped cream for a touch of novelty. Mix together flour, salt and sugar. In a food processor or with a pastry blender, cut butter into the flour mixture until it resembles coarse cornmeal. Mix in egg. Add a little water at a time, just to bring the mixture together into dough. Roll pie dough onto a floured surface, to about 12 inches in diameter and ⅛ inch thick. This will fill a 9–inch pie pan. Line the pie pan and let the dough overhang ½ inch. Pinch overhang into a decorative fluted shape if desired. Mix together pumpkin purée, sugar, pumpkin pie spice, salt, evaporated milk and eggs. Pour into prepared piecrust. Bake for 15 minutes. Then reduce temperature to 350°F and bake for an additional 40 to 50 minutes or until a knife inserted into the filling comes out clean. Cool pie on a rack for at least 2 hours. Then, cover and refrigerate until serving. Refrigerate a medium bowl and electric beaters for at least 30 minutes. Beat whipping cream, powdered sugar and ground ginger until soft peaks form. Spoon onto individual slices of pie.